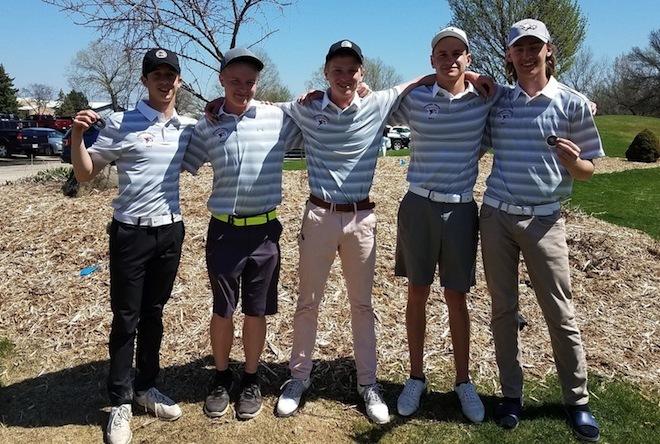 The Westosha Central High School golf team finished second among 16 competing schools in last weekend’s Fondy Invite held at Rolling Meadows Golf Course. From left: Jack Polick, Trent Steuber, Paul Lynch, Gavin Goldstein and Bryce Drier (Submitted/The Report). On the par 72 Rolling Meadows course in Fond du Lac, where the Westosha Central High School golf team competed against 15 other schools May 5, sophomore Paul Lynch finished in a three-way tie for first with a 73. Finishing first alongside Lynch were Zak Kulka of Beaver Dam and Kaukauna’s Brock Hlinak. Lynch’s top finish was courtesy of four birdies. Lynch, among 75 golfers, helped the Falcons place second, 11 strokes behind Fondy Invite winner Kaukauna. Senior captain Jack Polick, who registered a 77 to finish tied for 11th, said the team’s performance is only the beginning. “It has been an amazing experience being able to take the Captain role this year for the team and to see the younger guys develop,” he said. Meanwhile, for Lynch, Polick said the sophomore has shown poise and composure on the course. “Paul is not only an amazing talent, but the way he handles situations and pressure on the course is second to none. He is calm and collected and it has shown in his scores,” Polick said. Kaukauna, which fielded two teams, received its top score from the Orange squad at 301. Westosha Central, meanwhile, had two other players finish in the upper half, with sophomore Gavin Goldstein shooting a 76 to come into a five-way tie for sixth. Trent Stueber finished with an 86 to place 32nd. Team scores: 1. Kaukauna Orange 301, 2. Westosha Central 312, 3. Fondy Red 315, 4. Kimberly 326, 4. Mosinee 326, 6. Arrowhead 331, 7. St. Mary’s 345, 8. Beaver Dam 346, 9. Fondy Black 350, 10. West Bend West 360, 11. West Bend East 361, 11. Mukwonago 361, 13. Oak Creek 366, 13. Kaukauna Black 366, 15. Appleton West 404, Sheboygan South DNF. Westosha: 1. Paul Lynch 73, 6. Gavin Goldstein 76, 11. Jack Polick 77, 32. Trent Stueber 86, 67. Bryce Drier 103. Coming off a first place finish in an April 24 Southern Lakes Conference major at Brighton Dale Links, Wilmot Union High School senior Zach Strasser placed third in the May 1 conference meet held at the par 72 Gary Player course at Geneva National in Lake Geneva. Strasser, whose Panthers team finished third behind second place Westosha Central (325) and Major No. 4 winner Lake Geneva Badger (305), recorded a 75. Lake Geneva’s Blake Wisdom notched the best score with a 69 and teammate Blake Wisdom had a 73. For Westosha Central, meanwhile, Goldstein scored a 78 to lead the Falcons. Team scores: 1. Badger 305, 2. Westosha Central 325, 3. Wilmot 335, 4. Elkhorn 343, 5. Union Grove 356, 6. Waterford 375, 7. Burlington 453, 8. Delavan-Darien 474. Wilmot: 3. Zach Strasser 75, 7. Josh Peterson 81, 8. Dayne Schleusner 81, 27. Devin Spath 98, 34. Connor Stickels 109. Westosha: 4. Gavin Goldstein 78, 9. Paul Lynch 82, 10. Trent Stueber 82, 11. Jack Polick 83, 19. Bryce Drier 90.